This post is part of an occasional series about recent legal developments impacting technology and information access for people with disabilities. The series is illustrated by a toolbox — because law has proven an effective tool in improving the accessibility and usability of digital content, print information and technology for everyone. 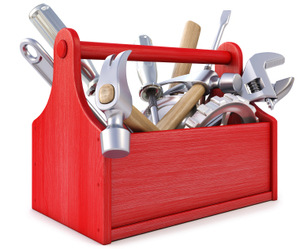 There are many ways to use the law, reflected by the many tools in the toolbox. This post contains legal developments between April 1 and July 15 2014. You can find the previous post in the series in the Legal Updates Category of this website. Follow the Law Office of Lainey Feingold on Twitter for legal updates related to information and technology access, particularly for people who are blind and visually impaired. If you would like to be added to my email list, please visit the Contact page. The Department of Justice continues to drag its feet on issuing digital accessibility regulations. Does it matter? In June 2014 I wrote a post about DOJ’s commitment to digital accessibility despite the regulation delay. The Department has repeatedly said that the Americans with Disabilities Act covers websites, even though there are no specific regulations on this issue. In early June the Department announced that regulations for private sector websites would be delayed until at least March of 2015. Visit the federal webpage referencing the delay. On July 9, the draft regulations for state and local government websites inched forward, moving from the Department of Justice to the Office of Management and Budget where they now await release. Earlier drafts of the regulations addressed websites only. Mobile should be included in any regulations. If not, the regulations will be outdated before they are issued. On April 2, 2014, NFB filed a lawsuit against three taxi companies and the maker of payment technology installed in the back of cabs. While self-service terminals and payment machines can be developed with built-in accessibility features, Southern California taxis are using inaccessible devices that force blind people to share confidential information in order to use the machines. Read the press release about the taxi technology suit. The Statement of Interest is mentioned in the Department’s list of Enforcement Activities. In the Statement, the Department also referenced that the ADA covers websites: “[t]he Department has long considered websites to be covered by title III despite the fact that there are no specific technical requirements for websites currently in the regulation or ADA Standards.” Read the DOJ Statement of Interest in the Lucky case. On April 22, 2014 the American Council of the Blind and three ACB members filed a class action lawsuit again the General Services Administration (GSA). The GSA operates SAM.gov, a web site that federal contractors are required to use when registering and renewing registration as contractors. The website is not accessible to blind contractors, which is particularly frustrating because GSA is the federal agency responsible for making sure that federal contractors comply with with Section 504 of the Rehabilitation Act. Read more about the ACB case against the GSA. On June 22, 2014 the National Federation of the Blind announced it had resolved a complaint with the Small Business Administration about that agency’s website. According to the press release, “The complaint alleged that SBA’s website violated Section 508 of the Rehabilitation Act because it was inaccessible to blind people who use text-to-speech screen access technology or Braille displays to access information on the Internet.” The agency agreed to remediate website barriers. Read the press release about the SBA settlement. Read the settlement with the Small Business Administration. In May a settlement was announced in a law suit challenging accommodations practices of the Law School Admissions Council, the entity that administers the Law School Admissions Test, or LAST. Under the settlement, the LSAC will not longer “flag” scores of students who had accommodations while taking the test. Flagging had alerted law schools that test scores of applicants with disabilities were not as valid as scores of students who did not have accommodations. Recognized accommodations in the settlement include braille, large print, and a “screen-readable HTML test.” LSAC also established a nine million dollar fund to compensate test-takers who had been discriminated against under the old rules. Read the LSAC Consent Decree. Read the post about the LSAC settlement from the Legal Aid Society – Employment Law Center, one of the lawyers for the plaintiffs in the case. On May 14, 2014, the Second Circuit Court of Appeals unanimously ruled that Board of Elections in New York City discriminated against voters with disabilities by failing to make its poll sites accessible to voters with disabilities on Election Day. Among the issues addressed by the court was the lack of equipment at polling places that would allow bind voters to independently case their ballots. Read the press release announcing the victory for voters with disabilities. Read the federal court’s voting opinion. Also in May, the NFB filed suit against the state of Maryland for its failure to allow electronic voting tools that would give blind voters the right to privately case absentee ballots. Read the Baltimore Sun’s article about the voting case. On June 2, New York Governor Andrew Cuomo announced a settlement with twelve New York banks to improve services to people with visual impairments. The settlements require that the banks’ websites be made accessible and that print information be provided in alternative formats such as braille. The agreements were the result of an investigation by the New York State Division of Human Rights. Read the press release about the New York bank settlements. The ability to independently read prescription medication labels is critical to the health, safety and independence of blind people. On June 3, 2014 Walgreens announced an historic first: The company now provides talking pill bottles for blind pharmacy customers at every Walgreens location in the United States. The initiative also applies to Walgreens mail order and to Duane Reade stores in New York and elsewhere. Duane Reade is owned by Walgreens. The Walgreens initiative is a result of Structured Negotiations brought by the American Council of the Blind and its affiliates in California and Illinois. Linda Dardarian of Goldstein, Borgen, Dardarian & Ho, and the Law Office of Lainey Feingold represented the blind organizations. Read the press release announcing Walgreens talking pill bottles. On June 10, 2014, the Second Circuit Court of Appeal — a United States federal appeals court — ruled in favor of readers with print disabilities in a landmark copyright lawsuit. The National Federation of the Blind intervened in the case to protect the rights of readers who cannot read standard print. Among other things, the Court found that providing digital content to readers with disabilities does not violate copyright law and is “fair use” of copyrights material. Read the press release issued Brown, Goldstein & Levy, lawyers for the NFB. Read the Second Circuit Opinion in the HathiTrust case. On June 12 eBay announced that it has “teamed with The National Federation of the Blind in a Web 2.0 Sustainable Accessibility Partnership Agreement that will enhance the accessibility of eBay’s website and mobile applications.” An eBay official was quoted in the announcement saying “Ease of use and universal access to the Marketplace is a priority for eBay as a company, and as a brand.” Read the eBay accessibility announcement. On June 30 a tentative class action settlement was announced in a case brought against Redbox because its movie rental kiosks are not accessible to blind customers. Kiosks can easily be made accessible with features such as tactile input methods and speech output. The settlement, in the case brought by the San Francisco LightHouse for the Blind and handled by Disability Rights Advocates still needs to be approved by the court. The settlement, if approved, establishes a 1.2 million dollar fund for blind customers who may file claims up to $4,000.00. It also requires Redbox to modify its movie rental kiosks for accessibility. Read an article about the Redbox settlement. Read the proposed settlement between the blind community and Redbox. This is a post about recent legal developments that affect people who are disabled. The new developments include a Walgreens announcement in June. Walgreens it is now offering talking pill bottles. The bottles let blind people know about their medications. Recently, people who are blind have filed lawsuits about their right to cast their own ballot. The governor of New York announced that banks in that state will improve their services for blind customers. This includes making bank websites easier for blind customers to use. Return to the post about recent legal developments.